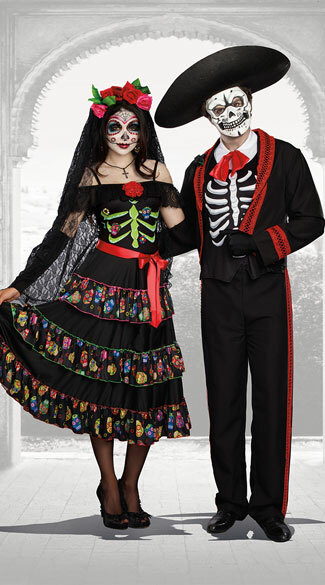 Chivalrously rejoin the realm of the living in this Men's Dude of the Dead Costume featuring a black shirt with white collar, red bow tie, and rib cage decal, a black jacket with red embroidered lining and lapel, a black rose, a red embroidered cuff decal, black pants with red embroidered tuxedo stripes, and a white and black skull mask. (Sombrero and Gloves not included). Make even the deceased drop dead in this seductive Lady of the Dead costume featuring a black off-the-shoulder dress with lace lining, a red flower applique, spaghetti straps, a form fitting bodice with colorful rib cage decal, a tiered ankle-length skirt with colorful skull detailing, a red bow belt, and a Gothic cross necklace. (Gloves, veil, and stockings not included).